Projects was first introduced to QuickBooks Online in 2016 bringing the program one step closer to the functionality provided by its desktop counterpart. Since its introduction, Intuit has been working hand-in-hand with small business owners and accountants toward a job costing solution that everyone would love. During this article we will share the best way to setup your company file to enable the new Projects feature. 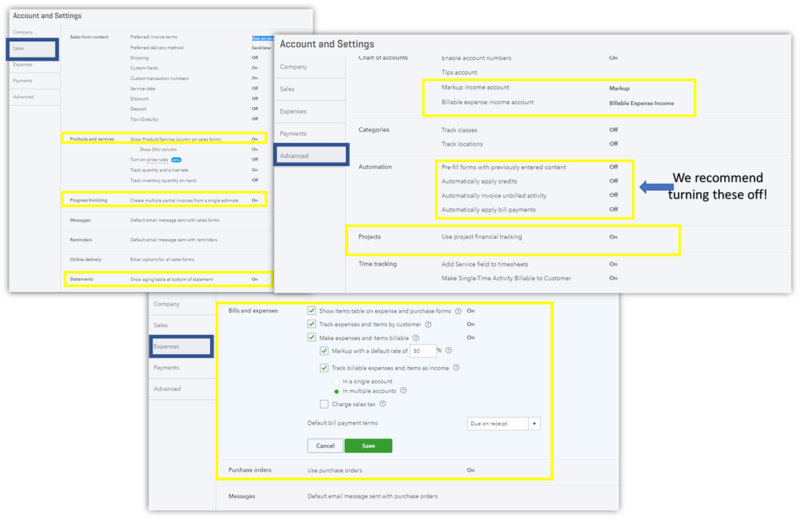 Remember the Project feature is only offered as part of QuickBooks Online Plus. Before we can get started we need to adjust some of the company settings to turn on the Projects feature as well as the Progress Invoicing option. Select the Gear icon at the top right side of the screen. Select the pencil icon on the Projects section to turn the feature on. 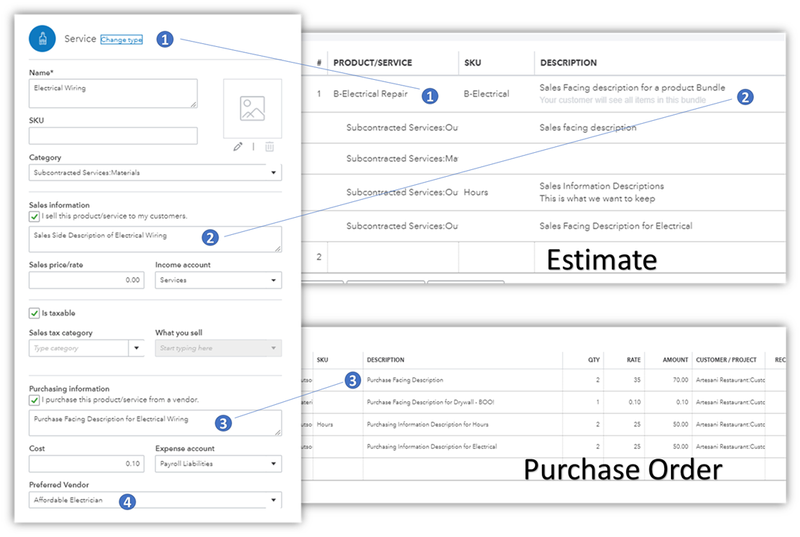 Create a new service item using both the sales and purchase descriptions (also known as a two-sided item). This will allow us to take the same item from the estimate and us it on an invoice as well as a purchase order which will be turned into a bill. 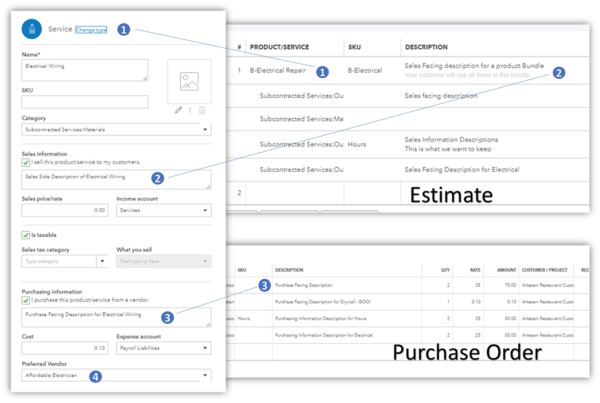 Use the sales description to display anything you want presented on the estimate & invoice. Use the purchase description to display anything you want presented on the purchase order & bill. Select a Preferred Vendor name to reference while ordering items using a purchase order. Job Costing is vital to the success of project-based businesses. Without proper tracking of expenses at the project level, you may never know how profitable, or unprofitable the job really was. At the surface level, job costing sounds very simple which often leads young businesses to dive in before they are truly ready. While some may not agree, we believe that job costing is something that a business needs to grow into. When it comes to proper job costing, business owners should know that will require about 4x the standard time commitment to their books FOR THEM. If you stop and consider all the client communications involved with each job and each expense approved for the job, it is nearly impossible for an outside accountant to properly assign transactions between jobs without a lot of help. Each project should begin by creating an estimate in QuickBooks Online. But before we can do that, let’s start by creating a new client and then a new project under that client. Create a new Customer if one does not already exist. Select Projects tab when the new customer record is displayed on the screen. Confirm the proper Customer has been selected for the project. After selecting the project that you wish to update, QuickBooks Online will display the project’s card where most of your tasks will be started. View this section to pull up a Profit and Loss report specific to this project. Anything that you tagged to this project will be included. Don’t forget to check if your reports are displayed under cash or accrual basis. This will display any time activities that you incurred toward a project but were not able to bill the customer for. This information can be useful to determine your effective labor rate for the job. This is one of the most important reports to check, this will help ensure you do not forget to bill a client for unexpected expenses or additional time spent toward completion. Select the transactions tab to view all your estimates, invoices, billable expenses, and bills related to this project. It is important to note that expenses that were tagged to the project will not show up in the transaction list, but they do populate on the reporting. Use this drop down to select the type of transaction that you want to add to the project. 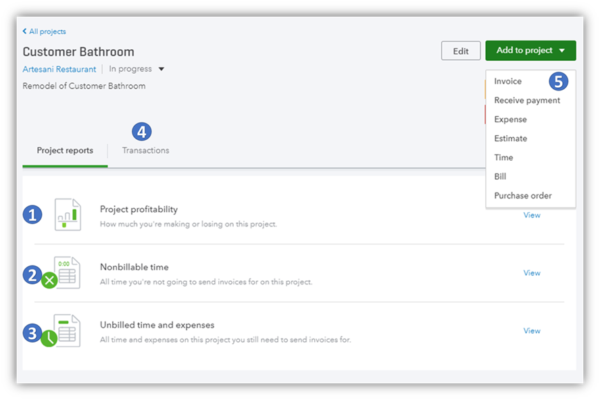 If you start each project with an estimate, you will have the ability to create an audit trail that links the money in and money out for the project. Track your Estimates and keep track of them. Was the Estimate pending, rejected, accepted or closed? It will help you track your closing ratio. 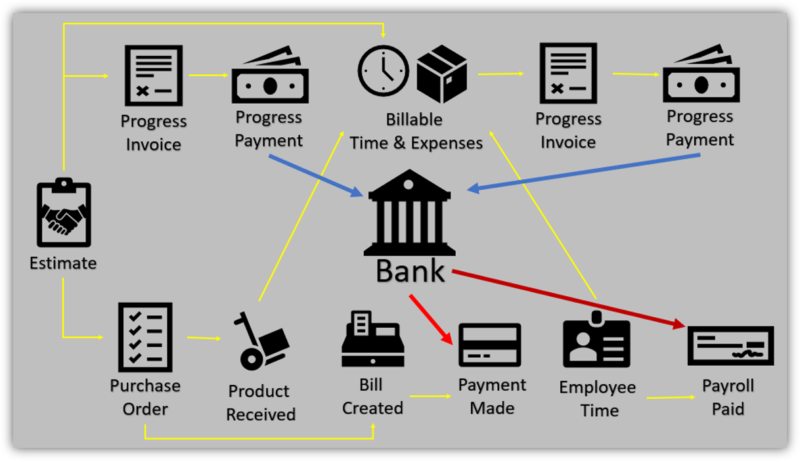 To simplify the workflow, there are two types of transactions that are applicable to job costing: Money In and Money Out. As discussed in the video, reports may look different based on your chosen accounting method. 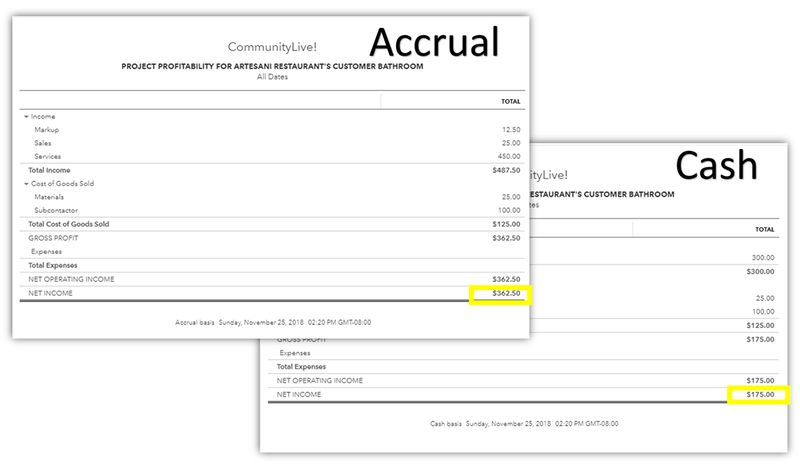 Accrual basis will show the transactions at the bill and invoice level. Cash basis reporting will show on the reports with the bill payment and invoice payment level. 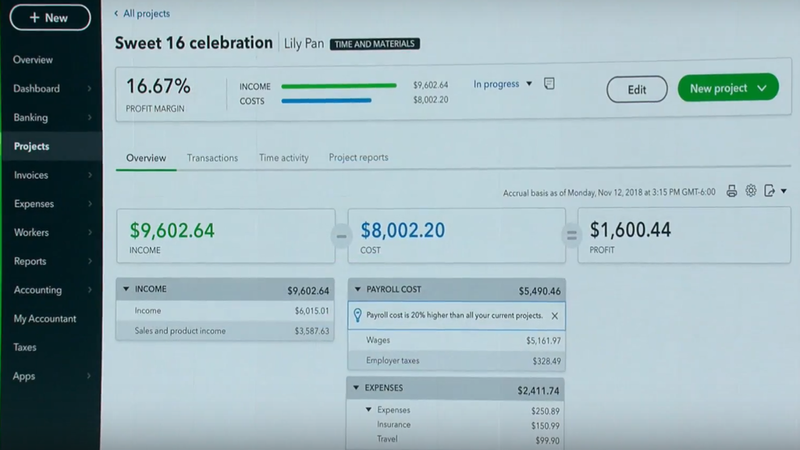 This year QuickBooks Connect new feature announcements were heavily centered around the advancements in QuickBooks Projects. The new dashboard design makes it very easy for business owners to evaluate the performance of all their current projects at the same time. With a quick glance this new dashboard beautifully displays the total income and expenses per job as well as the total time allocated to the job and the expected profit margin. For even greater detail, the business owner can drill into a project further and find a complete profitability dashboard. Thanks to their acquisition of T-Sheets at the end of 2017, companies utilizing QuickBooks Payroll with QuickBooks Online will be able to utilize time tracking directly from the mobile application. Employees will be able to select a project while clocking in allowing the company to track their labor efficiency against other projects running. Since it’s release, QuickBooks Online has been shunned by desktop users for its poor job costing capabilities. Thanks to these new improvements, I think even the most avid desktop fan cannot help but take a second look. QuickBooks Online may still have a ways to go before it could truly replace the power behind QuickBooks Desktop, but their cloud based counterpart has proven that it is here to stay. Parkway was created to bridge the gap between business owners and their financial information. By offering Accounting Solutions from the owners perspective, Parkway offers a simple path for accounting.